Of Fattori’s (Fattori) Giovanni (6.9.1825, Livorno 30.8.1908, Florence), Italian painter. 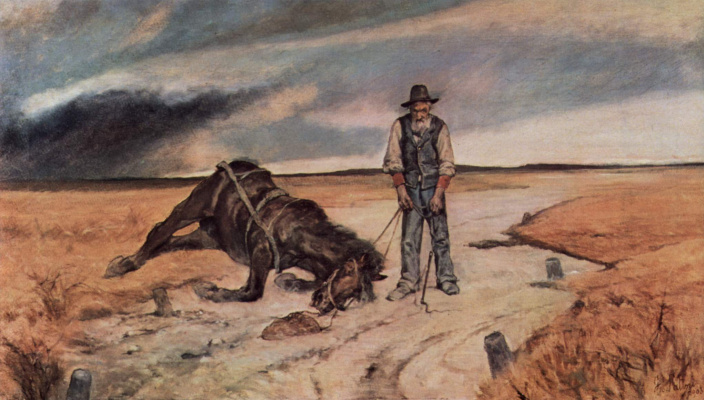 The master macchiaioli. 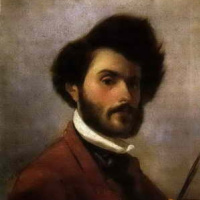 He studied at the Academy of arts in Florence (1846−49), where he taught from 1869. Member Of The Revolution 1848−49. 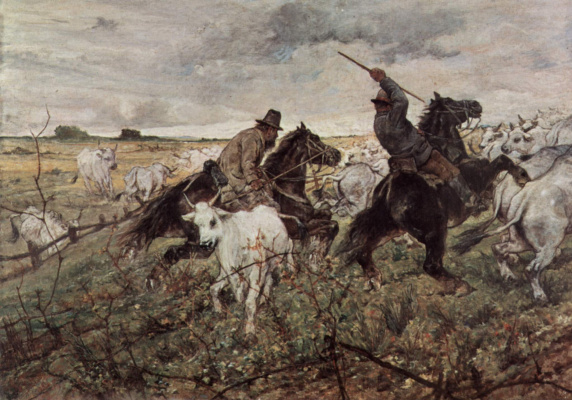 Found acclaim as the author of a huge battle paintings ("the Italian camp after the battle of Magenta", 1861, Galleria Pitti, Florence), but the real success achieved in small scenes and sketches, with life’s spontaneity, freedom of writing and sharpness of the composition ("White horse", a collection of carnielo, Florence; "on patrol", a collection of Mardzotto, Rome) and in acutely characterized portraits. Worked as etcher. Giovanni Fattori was born 6 Sep 1825 in Livorno. His parents were engaged in trade, and although the family wasn’t living large, but necessary does not deny. History is not brought us no details of childhood and adolescence, and colour — at least, those that would deserve special attention. Noticing the artistic ability of a boy quite early, the parents hastened to give him under the care of a local painter, Giuseppe Baldini. The latter was not much outstanding talent, but did their job: taught the basics of art Nouveau and art crafts. For twenty years our hero was close to Livorno. It is still poorly understood in painting, however, instinctively understood that more Baldini teach him nothing. After a long and not always peaceful, family talks, the young artist received from his parents blessing on departure to Florence. Soon, Fattori enrolled in a private school Bezzuoli. He did it hard enough, but grateful for the memories she left. Promaxis some time in a boring workshop Bezzuoli, a young provincial enrolled in the Florence Academy of art, where he happily studied for several years (with a break to participate in the revolutionary events of 1848−49). A thesis he wrote on the subject of the historical novel Grossi "Aldegonda", very popular at the time, painted in dramatic tones of the Risorgimento. At the end of the Academy life, and colour came the era of creative search that led him in the Florentine "Cafe Michelangelo". In 1855 the "Cafe Michelangelo" as a result of much debate and controversy formed group of artists United by a single creative program called the macchiaioli. 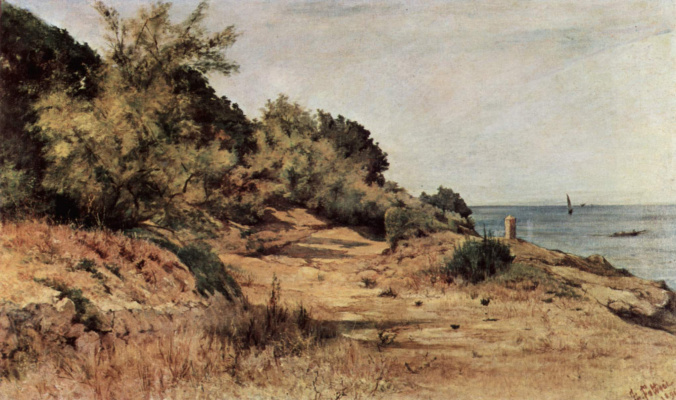 The group of macchiaioli included, in addition to Giovanni Fattori, the painter Telemaco Signorini (1835— 1901), Silvestro Lega (1826−1895) and many other artists of the 1820s — 1830s year of birth. 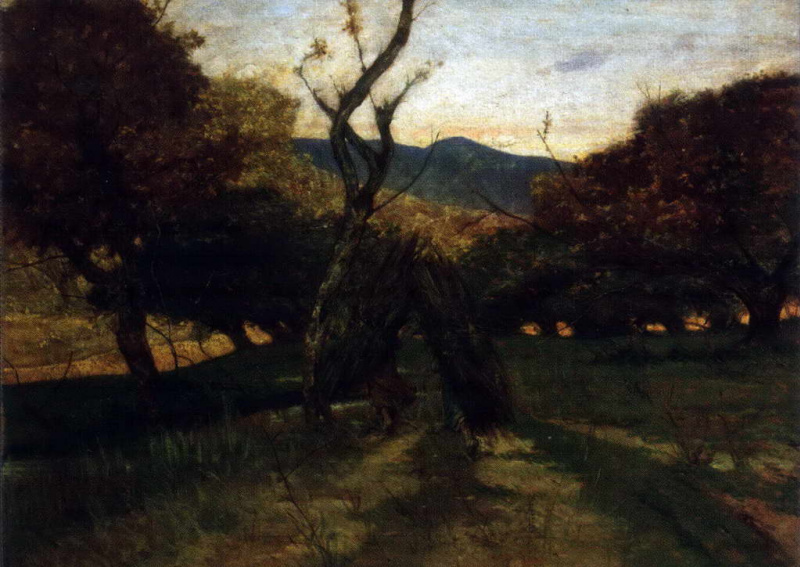 On the first "macchiaioli", Fattori later recalled with fondness: "We were poor and were razgulina-Bohemian lifestyle, however all this did not prevent us to feel happy: after all, what we did, we did in the name of art". In 1860 riotous living came to an end. Giovanni Fattori married Settimia Vannucci and for a time went along with her in Livorno, in the bosom of the family. The purpose of the trip was not only to the better acquaintance of a young wife with relatives. 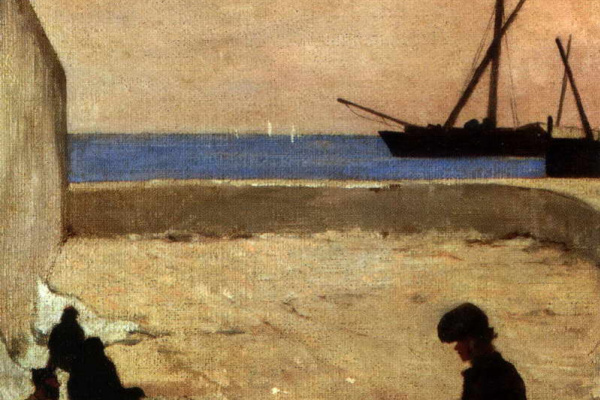 The artist was also hoping that the sea air will cure her tuberculosis which she suffered. Looking ahead, we say that the disease could not be stopped, and in 1867, and colour became a widow. Together with the bride and groom in Livorno went Nino Costa. With this wizard belonging to the classic landscape school, but who had eyes clear and unbiased. Fattori, spent hours walking in nearby Livorno. After the death of his first wife the artist for a long time didn’t want to think about that. to link your life with another woman. Burying your dreams about family happiness, he threw himself into work, into fellowship with like-minded people. 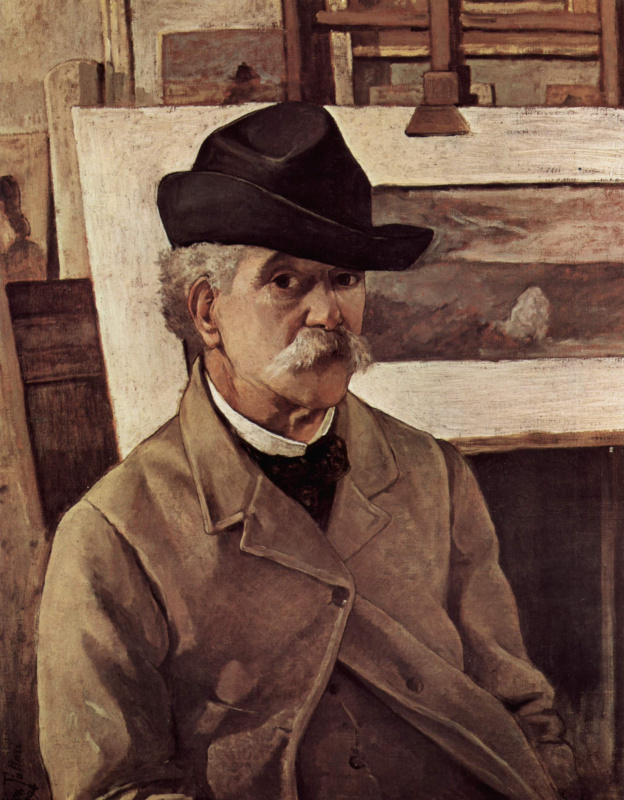 The most valuable, and colour was in a relationship with Diego Martelli, a writer and critic, has done much to promote the direction of macchiaioli in Italy and abroad. A lively and witty conversationalist, Martelli’t just give our hero some valuable creative ideas, but was able to distract it from fruitless suffering. In 1873 Civico Giovanni Fattori first visited Rome. The result of this trip were a few excellent works to attract the attention of critics. 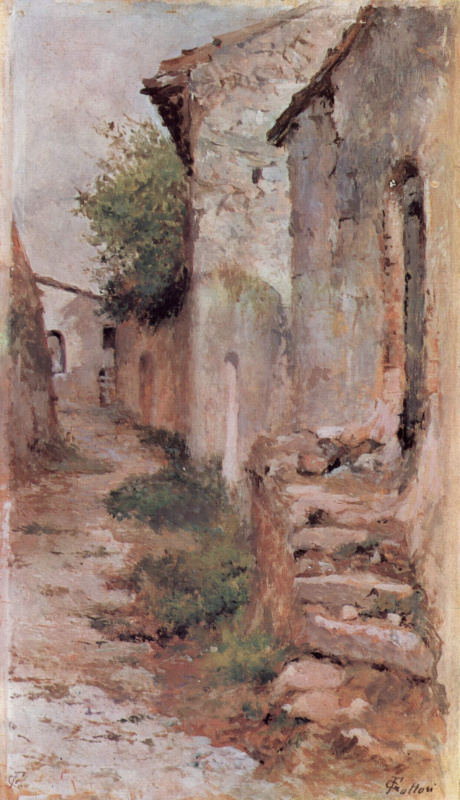 Immediately upon his return, he received an invitation from his friend, the painter Francesco Dzhioli (with him, Fattori met shortly before his departure for Rome), to live in his estate near Pisa. Fattori, happily agreed, but chores and hassle constantly postponed his arrival. "Joint holidays" the artists managed to spend only in the summer of 1875. Family Dzhioli and their hospitable home is connected with one of the most dramatic episodes in the life, and colour. At their Villa, he became acquainted with Amalie Fund or, the governess of the children of Dzhioli, struck him with his mind, with grace and tact. 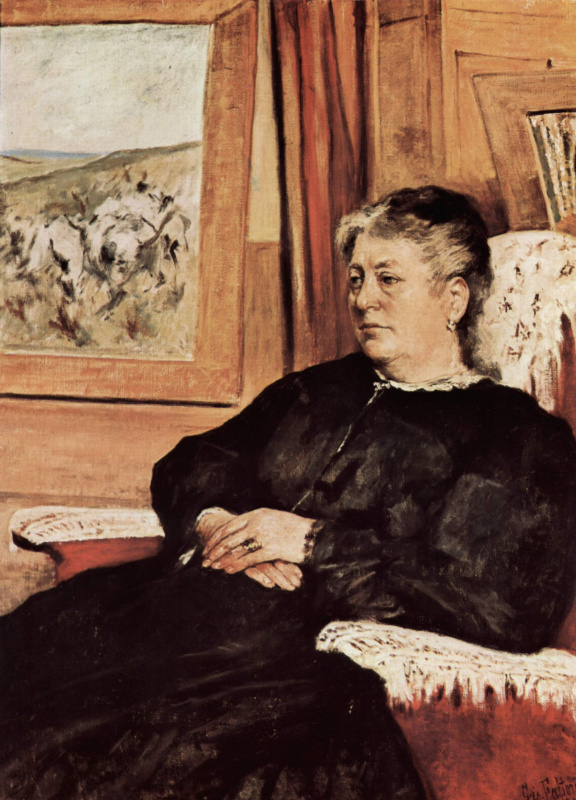 In 1880 between the artist and the governess broke novel. The lovers were so blinded by passion that behaved very carelessly, and their relationship quickly became known to others. Fattori, had to leave the house Dzhioli. The affair with Amalia Fund or became the first in a series of late loves the master. In 1885 he became acquainted with Marianna Bigazzi, which would six years later become his second wife (the famous "Portrait of the stepdaughter", created, and colour in 1889, is a portrait of her daughter). In the middle of the 1880-ies, and colour have already recognized the value in the artistic world of Italy. Since 1886 he has been teaching at the Academy of fine arts in Florence, in 1888, received the title of honorary academician of the Academy in Bologna (more like the title fell upon him from the horn of plenty). The culmination of this steady rise to fame and honor was the awarding of an art Nouveau gold medal at the world exhibition in Paris in 1900. Old age, and colour met hand in hand not with Marianna Bigazzi, wife Fanny Martinelli (she is depicted on one of the best late portraits of our hero), whom he married some time after the death of Marianna in 1905. Their marriage was a happy Union understand each other better people, but in 1907, Fanny died. The last months of the master’s life was brightened up only by the interaction with students and the memories of comrades young age.